The Hills, the jungle and the serene beauty of undulating tea gardens spread to the horizon. From the low lying agricultural fields to the High alpine Mountains of Sandakphu. The Red Panda, the Gaur, the leopards, the Rhinos and an innumerable variety of avifauna all around. From the Mangos of Malda to the Oranges of Kalimpong Hills. The bio diversity of North Bengal is unmatched anywhere. The people of North Bengal are also a varied lot. The tea gardens brought in Tribals from Bengal and Bihar in search of Job. The hill stations attracted people from neighboring Nepal, and the partition of 1947 brought in Hordes of Bengalis from Bangladesh. Along with the local inhabitants known as the Rajbansis, this made a heady mix of culture and traditions. Trekking is the best option to reach many of the destinations of north-bengal. naturebeyond is highly experienced in organising treks for small as well as large groups of Indian and foreign guests.The most common trek is to Sandakphu. The trek passes through the Singalila range (habitat of red panda). Sandakphu is the highest point in West Bengal and a unique place from where one can view both the Kanchenjunga and the Everest range of mountains simultaneously. There are a large number of other options some of which are briefed below. Sewak-Loleygaon trek - A low altitude trek in the Kalimpong Himalaya that begins on the bank of River Tista and ends at the famous tourist destination of Loleygaon. Neora Valley trek - The Neora valley national park is famous for its virgin forests. Trekking inside the core area of the forest is restricted. The periphery of the forest also makes interesting trek. One entry point is Lava near Kalimpong. The other major entry points are Samsing and Todey. Darjeeling-Tista - The Hill cart road connecting the Hills with plains and the Sikkim-Bengal highway, run almost parallal to one another. At any point the distance between the two arterial roads of the hills is about 8-15 km. The patch of hills provides some of the best treks. West Dooars treks - There are a number of trek possibilities in this region including trek to Rupam valley in Bhutan, trek to Buxa fort and suntalekhola, trek in the Bhutanghat region, trek in the moraghat or chilapata forests etc. Mountain Biking is the best way to see the most exotic sights of the Himalaya such as ancient trade routes of Trans-Himalayan traders and the mystifying rural life of the hilly towns and villages. Infact, biking and hiking make the best adventure options to witness the timeless cultural celebrations and life styles of the hill people as well as the rich bio-diversity of the Himalayan heritage.You do not require any special permit traveling within North-Bengal. But if you are an International tourist and have plans to move onward to Sikkim or Bhutan, you will need permits for that, naturebeyond also organizes these permits for its guests on request. 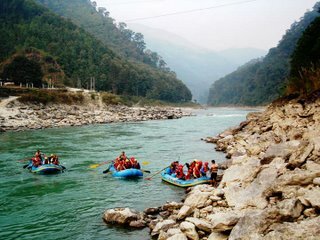 White water rafting in Tista was introduced in Darjeeling hills more than a decade earlier and has gained tremendous popularity since then. Several private organisations along with DGHC tourism have set up rafting facilities.River Tista is graded at IV on an international scale. With a series of rapids with varying intensity and character, Tista extends a challenging invitation to the enthusiasts. North-Bengal is endowed with some of the richest natural forests in India. The forests of the region include Tropical Moist Deciduous, Himalayan Moist Temperate, Himalayan Dry Temperate, Tropical Semi Evergreen, Tropical Dry Deciduous, Subtropical Broadleaved Hill, Subtropical Pine forests. West Bengal has forest cover of 1.19 million ha, much of which is in the Darjeeling and Dooars region of North-Bengal. There is a tiger reserve in the region known as Buxa Tiger Reserve (BTR), wild life sanctuaries at Jaldapara and Mahananda, National parks at Gorumara, Neora Valley and Singalila.With such wide and varied forest cover, the region is also home to a large variety of fauna. The animals in the forest include Rhino, Tiger, Leopard, different varieties of Deer, Gaur, Monkey, Bear, the Himalayan red panda and countless other species and subspecies of birds, reptiles and animals. The camps offer a tremendous opportunity to know nature first hand, to understand the unique natural eco-systems of North Bengal, to know about the environmental problems and finally to participate actively in programs launched to combat such problems. Yes you are right North Bengal Jungle tour is one of the adventurer tour. I love North Bengal jungle tour. So many adventures are there.